The gray fox (Urocyon cinereoargenteus) is a moderate-sized mammal that is a member of the family Canidae, along with the swift fox (Vulpes velox) and the red fox (Vulpes vulpes). These solitary foxes are adept tree climbers and are also very rapid and nimble movers in general. Gray foxes live all over North and Central Americas, from Canada and Colorado to Panama and Mexico. The coat coloration of adult gray foxes generally is a blend of gray, black, red and white. They usually weigh in the range of 7 and 13 pounds, according to the Department of Environmental Conservation for New York state. From head to tail, they're usually between 31 and 44 inches long. 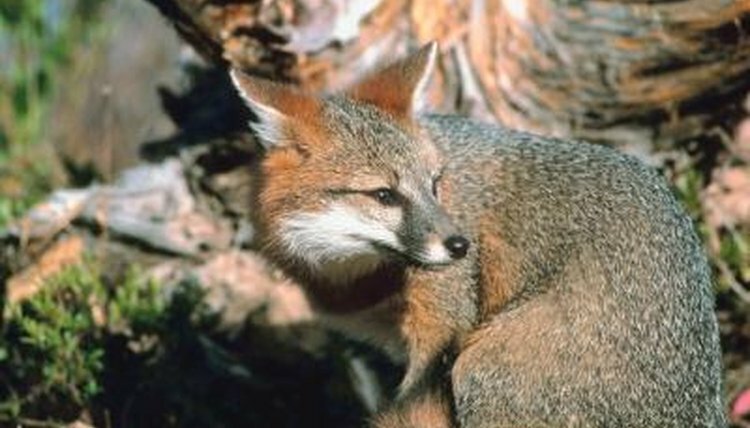 As far as natural habitat goes, gray foxes often opt for deciduous forests that are close to reliable sources of water. They also frequently live in rugged environments and in shrubland. Since gray foxes are omnivores, they feed both on plants and on meat, although they may favor the latter, indicates the Indiana Department of Natural Resources. Some staples of the gray fox diet are eastern cottontail rabbits, voles and field mice, although they also readily eat birds, reptiles, bugs, acorns, grains, nuts, apples, grapes, corn and eggs. These foxes aren't too picky about their sustenance. Gray foxes also sometimes eat carrion, which is decaying animal flesh. As far as carrion goes, they gravitate toward pigs and horses. Their insect dining options include butterflies, crickets, beetles and grasshoppers. Scavenging behaviors excluded, gray foxes obtain their meat by hunting, which is something they learn by observing their parents as wee youngsters of around 4 months in age. Gray foxes engage in hunting and feeding activities during the night hours, and generally do these things independently -- no help necessary. The gray fox hunting technique consists of a lot of clandestine following behaviors, as well as pouncing. As for plant-based foods, gray foxes forage for them, often up in trees. Like many other species of animals, gray foxes sometimes partake in hoarding behaviors -- a means of saving up precious food for leaner, hungrier times. If a gray fox is lucky enough to get his paws on more food than he needs for that specific day, he may dig out his own burrow to safely place his stash there. To discourage other animals from accessing their food supplies, gray foxes generally "claim" the spots by urinating directly over them.